This is the view to the east, with the Northern Luzon mountain range in the background, and the tip of Bangui Bay in the lower left. This image shows 9 of the 15 turbines of Bangui Bay. These 15 wind turbines(called Vestas NM82) provide a total of almost 25 MW of power and is part of the Luzon Island grid in the Philippines. Height of these windmills is 70 meters. Each of the three blades has a length of 41 meters. The wind swept area of the rotors is approximately 5,280 square meters. Each windmill is 326 meters apart, almost 1/3 of a kilometer. 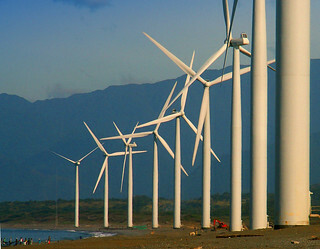 Location of the turbines is at Pebble Beach, on the shores of Bangui Bay, Ilocos Norte province. 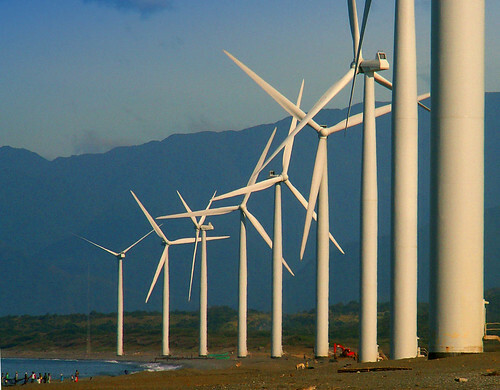 These turbines is the first power plant of its kind in the Philippines and Southeast Asia.